Pink Milk: So NOT A Party Political Broadcast! So NOT A Party Political Broadcast! Do you ever have mornings when you suspect that the ugly fairy has paid you a visit whilst you slumbered? Hmmm, well she certainly graced me with her presence last night. Mr Brown would have felt aesthetically superior to me this morning. My hair was a lumpy heap. The greys which are, it must be said, usually in the minority had obviously decided to fight back and not only multiplied during the night but were actually standing to 'LOOK AT US' attention. Yesterday's mascara from just my right eye had somehow worked it's way messily down my face so I looked like a scary Pierrot. My mouth had that sloppy look that shouts 'I've been drooling and snoring like a bugger for eight hours'. My skin looked creased and didn't seem to fit properly. Well, I don't need to tell you that I didn't hang around when I dropped the blondies at school at 8am. In fact I was a little tempted not to stop at all and simply hurl them out as we passed the gate. There was no way I was going to get cornered by one of the immaculately made-up and exquisitely-dressed mothers this morning! Skip forward a couple of hours and a LOT of help from Messrs Pantene, Clinique, Benefit, GHD, oh, and gravity, and I am finally ready to face the day! Or what's left of it! As for the grey hairs, well they have been temporarily flattened but their days are numbered. As soon as my hairdressers opened, I telephoned and made an appointment for a cut and highlights. Phew, it's hard work being a woman. So I think I might stay up all night tonight. Not to watch the election results but to catch that nasty ugly fairy in case she has plans for a return visit. There are no pretty pictures or a moral to today's story, just thought I'd share it with you. Please say you have ugly days too. You will definitely look better than Mr Brown on your WORST day!! I cannot bear to look at him!!! This is not a feeling I often get either!!! Had to watch it again! It might make you laugh and Clive Owen is worth watching! My Four year old is due to start big school in September and I am so not looking forward to the playground politics or the fact that I will have to actually put some thought into my attire, hair and make-up.... I fully understand your drive by desire for dropping off the children... as my other half says some people manage to hit all the branches when they fall out of the ugly tree! PS, I'm sure you can't possibly look worse than Gordon. Oh good grief yes, I have those days too and I have laughed my head off reading this post! I love it when I wake up with a deep pillow crease down my face and that gormless expression that seems to stay put for at least an hour after waking! As for the grey hairs...dont talk to me about grey hairs, they are popping through rapidly at the moment and Im pretending I cant see them! 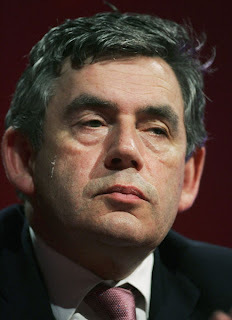 Aw Big Bloody Meanies about Gordon Brown! Have you not seen the photos of him when he was uni? I fear I look the same in the morning as I do when I drag my weary body off to bed at night after long hours of gravity. I know that feeling Heather, it takes longer and longer to sort the face and hair out. That's age for you, bit of a buggar if I do say so myself. Hell, I avoid looking at myself at all until I am showered and shampoo'd for fear of scaring the absolute crap out of myself. Sometimes I might catch a glimpse of myself unintentionally and be scared by the fat ugly trespasser in my house. Lycra and makeup. Love em both.